Join us for an exclusive First Pour & Tour at Avocado Festival. Be among the first to enjoy this year’s Avocado Ale, while experiencing a VIP tour and tasting led by Dieter. Tickets are just $5, which also includes a pint of Avocado Ale. Proceeds from the First Pour & Tour will go to Food Forward. 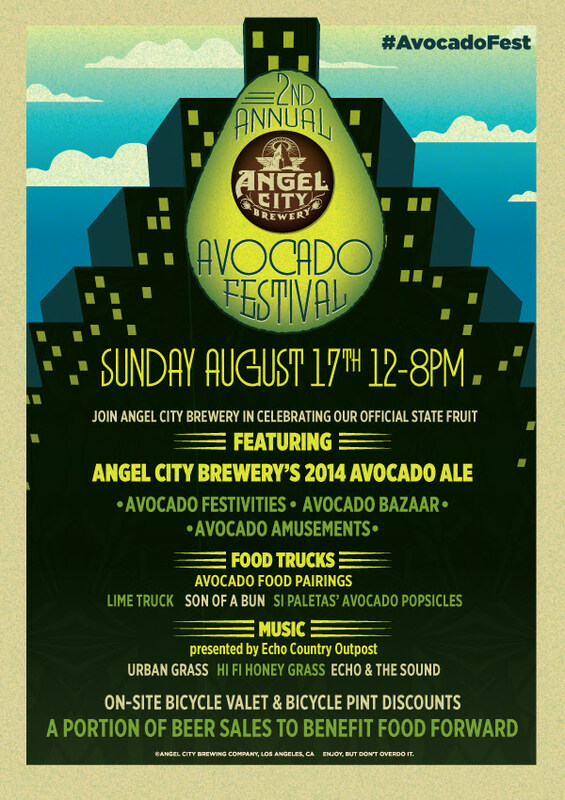 One of Los Angeles’ most anticipated summer beers, Avocado Ale, and the celebration that helped put it on the map, is returning in all of its green glory on August 17th at Angel City Brewery. As part of the event, we’re offering an exclusive opportunity for our e-newsletter followers to join us for the First Pour & Tour at the start of Avocado Festival. Be among the first to enjoy this year’s Avocado Ale, while experiencing a VIP tour and tasting led by Dieter. Tickets are just $5, which also includes a pint of Avocado Ale. Proceeds from the First Pour & Tour will go to Food Forward. Space is limited, so get your tickets early. Can’t join us for the First Pour & Tour? No worries. We’ll be running tours throughout Avocado Festival and there will be plenty of Avocado Ale to go around.